DeerFever was once the home to an optics company who has since phased out their line of products. Through network communications with the owner we decided to reformat and manage the site under a new look with a totally different concept on the contents. In June of 2004 we began some minimal work and bug testing before we began the actual build. We realized the potential for the site as a species specific venue geared towards Deer Hunting and the wheels were set into motion. Our main purpose of course is to provide deer hunting information for public consumption. But at the same time we decided to take that one step further by also offering the gear needed to use that knowledge. 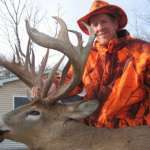 Hence the motto: DeerFever: Get the Knowledge – Grab the Gear! We feel this really brings the site full circle and offers our members and visitors the chance to actually put that knowledge to work. Whenever possible we will link products in our articles to the area where that product can be found in our online shopping area. Many times there will be a large choice of brand name products so you wont feel limited to just one product. What it comes down to is we want to give you the info and gear to be successful in the outdoors. We strongly support the outdoors community in a pro-hunting choice and will bring you the latest information available through our many network connections. We will also be posting time dated references as to what is happening in the world of deer hunting. If theres a new potential record, new laws, new political agendas, or updated policies, you will see it here. Bringing awareness to these areas whenever possible is our pledge to the community by using the website as a vehicle of information for distribution. We would like to Thank each person that takes the time to visit DeerFever or get involved in the community aspect found within these pages. Without your support this site just wouldnt be possible.